If A = 5, B = 6, C = 7, D = 8 and so on, what do the following numbers stand for? How many 8’s are there in the following sequence which are preceded by 5 but not immediately followed by 3 ? Which one of the following methods is best suited for mapping the distribution of different crops as provided in the standard classification of crops in India ? Which one of the following does not come under the methods of data classification ? Which one of the following is not a source of data ? If the statement ‘some men are cruel’ is false, which of the following statements/statement are/is true ? Which of the following is type of LAN ? Which of the following organizations looks after the quality of Technical and Management education in India ? The principle of natural justice is followed by the Courts. A reasonable opportunity of being heard must be given. Who among the following holds office during the pleasure of the President of India ? 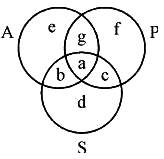 Question are based upon the following diagram in which there are three interlocking circles A, P and S where A stands for Artists, circle P for Professors and circle S for Sportsperson. The region which represents artists who are neither sportsmen nor professors. The region which represents professors, who are both artists and sportsperson. The region which represents professors, who are also sportsperson, but not artists. Allow students to do what they like. Deal with the students strictly. Give the students some problem to solve. Deal with them politely and firmly.